Let the hospitality continue after your party is over with takeaways for your guests. 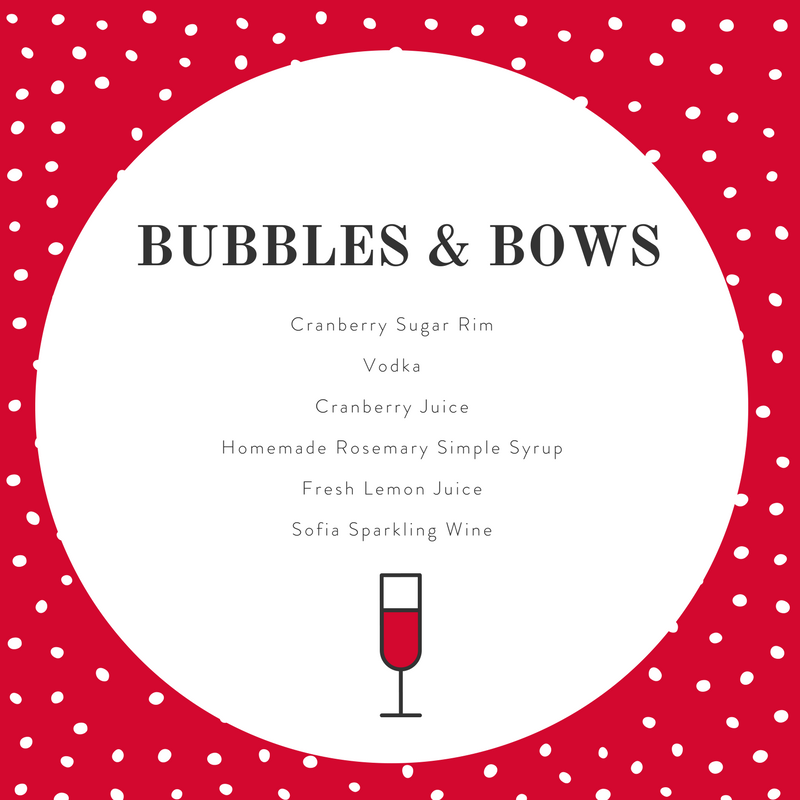 We then took the elements of each drink and created both hostess gifts around the drink and giveways for your party guests. It was holidays galore and we had so many examples, I decided to divide this post into two parts. You can read Part II here. Today's post is how you can create themed giveaways that your guests will love. This is not a sponsored post, but Coppola Winery and Four Roses Bourbon and Tito's Vodka did help us and supplied product for this event, for which we were so grateful! After an evening where you have fed, cocktailed and entertained your guests, do you need to give them something as they leave? Of course not! But it is fun, and your guests will feel that little extra special something. What is realistic for you? How many people are you having? What is your budget? How much time do you have? If you have 50 people at your party, it’s one thing. If you have six, it’s another. Is your budget $50 or $500? Are you all about DIY or do you need to find something assembled by someone who does this all the time and has it down? Make it make sense. In other words, how does it fit in with your event? In our workshop and in this post, I am marrying the gifts with the cocktails. You don't have to tie it into the cocktail or menu at all, but try to make it make sense with the party. Help connect the dots in your guests' heads. Is it something they care about or can use? Don't give something to just give something. You know when you go to a party and you get a little bag as you leave and then you open it all excited and then it contains 98% paper (brochures, business cards, etc.) and maybe a chocolate?). You are almost more disappointed then if you hadn't received a bag at all. Even tiny things can have great value. Think about how they will feel when they see it and when they get it home. Since the point of this workshop was cocktails, we included the recipes with almost all of the takeaways. If you read the recipes, you know that the most intimidating thing about the first two is one has a Rosemary Simple Syrup and one has a Spiced Ginger Simple Syrup. Simple syrups are SIMPLE, but that's not how most people see them. So, to provide the value, why don't you take care of the most "difficult" part of the recipe for your guests. Then, theme it a bit. We did the Rosemary Simple Syrup in a tall bottle so that we could tape a fresh sprig of rosemary to it, then printed the recipe, punched a hole, and tied it with a cute ribbon that was on-theme. I stuck with traditional colors, but if your holiday decor is all blue and white for instance, why not tie it with a blue and white ribbon and display the bottles near the door where you blue and white-wrapped gifts? For Hunt & Gather we put it in a more rustic container, as it felt a little woodsy, wintery. Found a woodsy/wintery ribbon and put the recipe on a chocolate brown card stock. A bit more -- around $10 each - Three cocktail ingredients. We used brown craft bags, but you could use any color. TIP: You are going to seal this bag, so try and put something scented and natural in the base of the bag, as that will be another element of surprise. It also acts as a base/cushion. For the first drink we used fresh rosemary and for the bourbon drink, we used frasier fir. 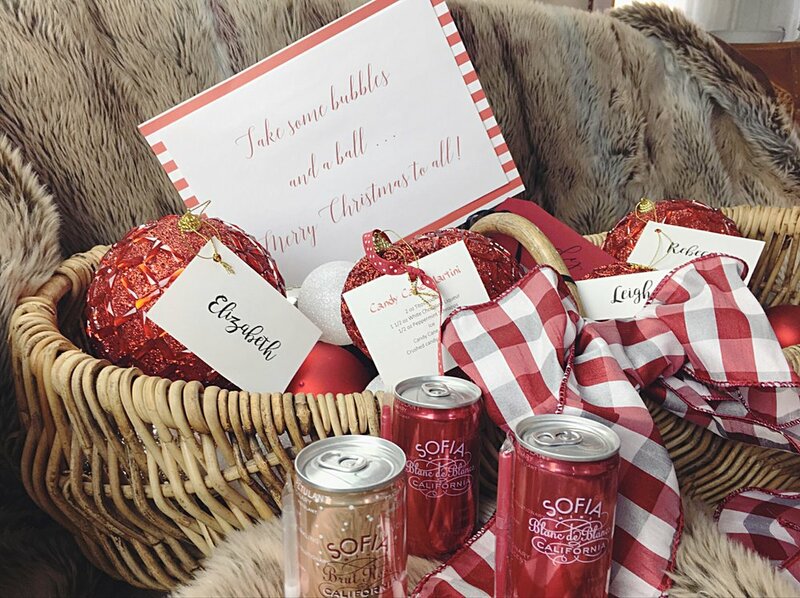 A can of Sofia (these are fabulous cans of sparkling wine - so much fun! They even come with a straw for sipping - see above!) There will be more on Sofia in Part II. In the example pictured here, we put the recipe on the inside, found a ribbon that went with our decor and theme, and used the little baby clothespins to seal it. We also put a personal note in each bag, thus the name. For the bourbon drink, used a winter plaid ribbon instead, and didn't include a personal note, so we put the recipe on the outside under the clothespin. At Boxwoods Gardens & Gifts in Atlanta, we found a box of bourbon balls in a cute box. Put it in a leather or woodsy basket at the front door. How easy is that? Buy small flasks and fill them with alcohol of choice and make sure they know it! Tie a tag around the flask that says something like, "Tito's in here!" SIMPLE - around $3.50 each. Thinking that this was a lot of cocktailing, our minds went to coffee. So we used these Chocolate Peppermint tiny bags of coffee, put two white chocolate squares in a little bag, stapled it on and added the recipe. FUN AFTERTHOUGHT: also attach one of those travel packets of aspirin! A bit more: about $20 each. At Huff Harrington Home in Atlanta, I found these precious white snowflake votive holders. I put crushed candy cane in the bottom, and then put the white chocolate liqueur in a container and added a mini bottle of Tito's. LOTS more about Huff Harrington in Part II. BONUS: use the votives with the crushed peppermint and a candle at each person's place around the table. Then, it will tie in even more with the gift. Waiting on Martha Home (new location in Vinings Jubilee) in Atlanta has these adorable spreaders. Use them at your party and then put a big basket of them by the door -- EASY! Take some bubbles and a ball -- Merry Christmas to all! You could very simply leave it at that. Or, you could tie the recipe to each ball. Or, you could put a name and a personal note on the back, wishing each of them a personal happy holidays. 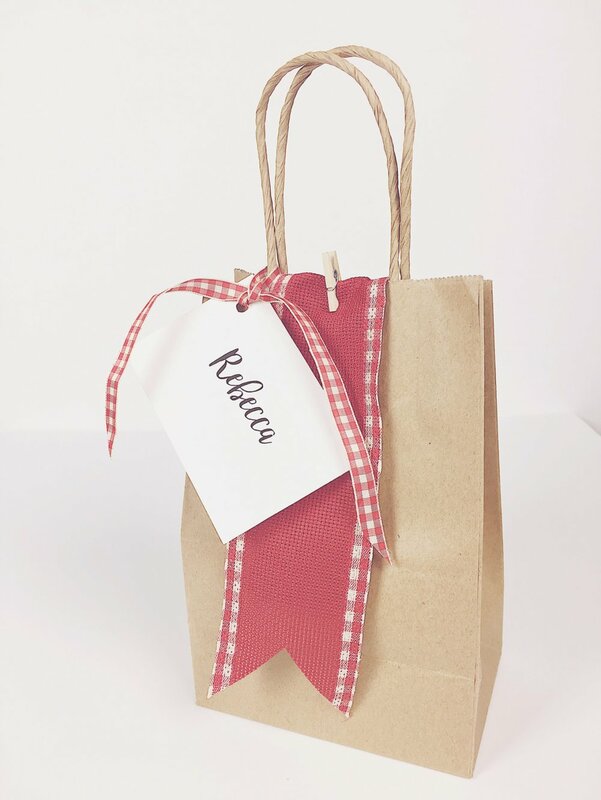 take-away gifts for your guests. And, have fun! How many guests? What is your budget? How much time do you have? How can they use it? Does it have value? Where is the unexpected – the surprise – the creativity? 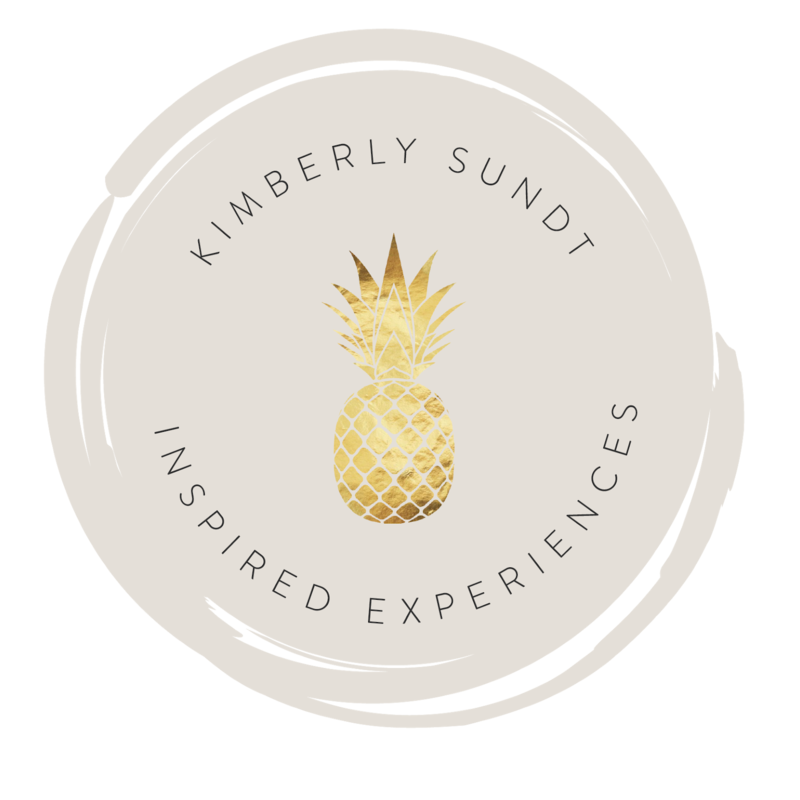 Read Part II here - all about using these cocktails for creative host and hostess gifts.